The witching hour is practically upon me...I've been working like an insane person, compiling a packing list, studying my Italian verbs, writing way too many instructions for the cat/housesitters, and all that's standing between me and my vacation is two more (very full) days at work and, you know, the actual packing part. David and I have been spending most of our evenings at home this week, both to get more time in with Ingrid and to get ready to go. Have you ever been so behind on blogging that you stop taking photos of food because you don't need more things to blog? In the past week I have not photographed a terrific seafood risotto, a marvelous chicken piccata and a zippy fennel salad. My future blog entries runneth over, though the chicken piccata was both easy and tasty enough that I expect to make it again this summer and will blog it then. The exception was the cabbage rolls that I made earlier this week out of the head of cabbage that was rolling around in the vegetable drawer begging to be used. A word of caution on making these: my sweet little organic head of cabbage made this recipe more difficult--ideally, a cabbage with larger leaves would be better. I found myself with a lot of leftover filling on my hands, which I made into meatballs and served with pasta last night. Finally, a thanks to those who commented on my mention that I had a no good, very bad day last Saturday. Some of you may recall that I there was a situation with a friend with whom I was very close, who was having lots of issues during a play we were working on last fall and subsequently left the production. He's said lots of awful things about me, and I've just been trying to be dignified and keep my head up because confronting him would have been pointless. He has some significant problems and somehow I've become the scapegoat for them. At a wedding we were both at last weekend, he yelled at David. At the wedding. Horrible and humiliating and painful, so of course I burst into tears and David and I left the reception. This has been going on for six months and it's not getting any easier. I hate being such an emotional person. It's hard to write about this, even in kind of a detached manner. So again, thanks to all who offered their support. Whew. And now on to the cabbage rolls. Start a large pot of salted water on the stove to boil. When it is ready, add the cabbage leaves and blanch them until they are soft, about two to three minutes. While you are doing this, start the oven to preheating to 350 degrees. When the cabbage leaves are done, remove them from the water and place in a colander to drain. 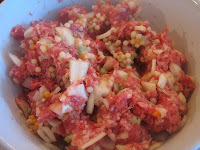 In a large bowl, combine the ground beef, sausage, onion, rice or other pasta, and a little salt and pepper. Use your hands to make sure everything is blended together. Spray a large baking dish with nonstick spray or rub it with a little olive oil. Using your hands again, shape the meat mixture into small rolls and place one in the center of each cabbage leaf. Tuck the edges of the leaf around the bottom of each roll and place in the baking dish. Once all the rolls are ready, pour the broth and then the crushed tomatoes over them and sprinkle with the parsley and basil. Tuck the bay leaves into the pan. Bake until the rolls are cooked through and very soft, about 45 minutes. Makes twelve rolls, for about four main-dish servings. Serve with a green salad and bread. You have been a busy bee! Wrapping up things before going on a trip can be daunting sometimes because you always fear forgetting something. Regarding the issue with your friend, my dad had a guy at work that humiliated and was rude to him on a regular basis. Turned out that the guy had cancer and eventually passed away. With that in mind I am glad you realize that you are just the scapegoat and not the real issue. Your cabbage rolls do look good, I have never made them before but my husband loves them. I really should try them out, they do not look as difficult as I thought they would be. Wow, I'm sorry about what's going on with your friend. That's just terrible. On a brighter note, the cabbage rolls look wonderful. 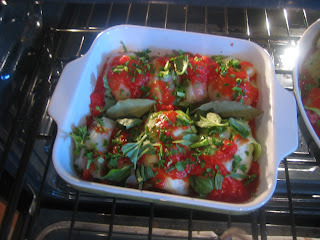 I'm thinking I should send this recipe to my mother who loves cabbage rolls. your cabbage rolls look great! i always want to try making them but then become intimidated but the process. but yours just look so tasty i need to get over it and try these! 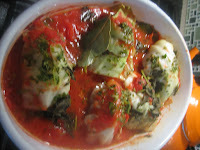 The cabbage rolls sound really yummy with alot of basil and parsley,with chicken probably best for me,,,YUM !! 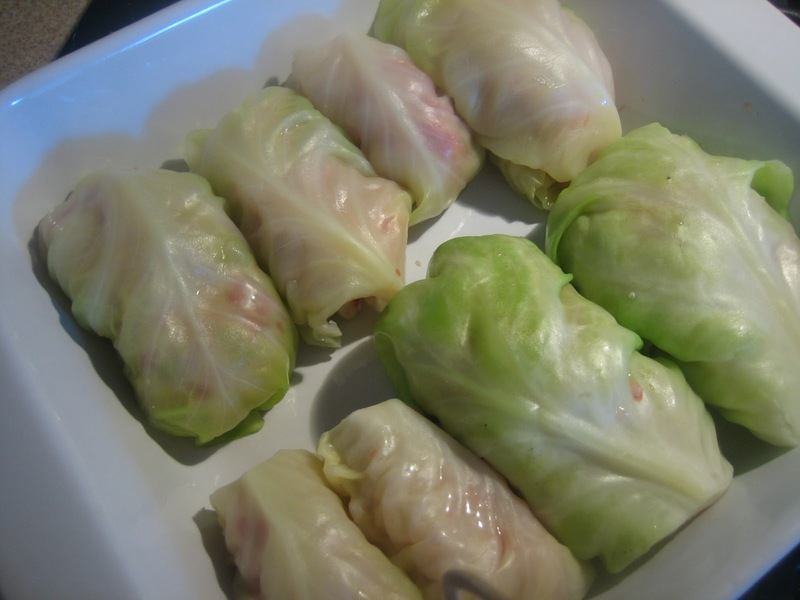 Lovely lovely recipe!I've been wanting to make cabbage rolls since a long time, but somehow never got round to making them..Yours looks so delicious and yummy!Bookmarked! Soni, you should make these--play around with the filling and let me know how it goes! I know what you mean - I hate being upset too! It just feels awful to be hurt and frustrated and not know what to do to make a situation better. I hope there's a solution in your future! What kind of a friend is this who can be rude in an occasion like WEDDING but if you know that she has some issues then I guess you are doing the right thing by being a scape goat. Cucina, Your cabbage rolls look delicious. I made them once with Napa Cabbage and I realize it was the wrong cabbage for these particular rolls. That's the worst of it--who behaves like that at someone's wedding? Fortunately, I think the bride and groom didn't know anything about it. This looks wonderful! I miss Italy every day I'm not there. One day I moving! Hope you figure out a solution to your problem soon my friend! I have been with my busy schedule too but somehow squeeze the time in between but its with compromising with my sleeping hours. About the photos, if I forget to take the pics, my other half is like a standby reminding to do that and esp before he starts eating. I have done some cabbage rolls before but not into the broth like you did. I have to replace the beef and this is something unique for me to discover. Definitely we will enjoy with a plate of white rice. I feel as if I can smell the aroma off my computer screen! And I love the colors! Enjoy your trip to Italy and don't leave anything spoil it for you! If you feel alright with yourself then nothing else matters! The rolls look awesome. We make almost the same in Greece! Thanks, Katerina. That's the one comforting thing--I'm far from perfect, but this time it isn't something I did. This is scrumptious, down-home, comfort and comfortable good and just what the doctor ordered. And Italy beckons. And if the gods smile, maybe one day things will heal. Meanwhile there are friends, family and food. Thanks, Claudia. This situation will get better--time heals all wounds, right? Venting always helps a bit. I just always try to remember that we have no idea what the are going through, not walked in their shoes, etc. Sorry about the wedding fiasco---uncool. Hope you have a great trip! I can imagine you've been busy. Taking photos on a tight schedule, or loss of motivation can me frustrating and I totally understand that! This is one of my favorite dishes while growing up, although bit different than I usually make. Thank you for sharing his recipe.. I saw Ina Garten make these once. I have always wanted to try them out. Wow, yours look amazing! YUM! This meal looks amazing- I love everything in ti! The cabbage rolls look delicious! And as for your friend, as long as you know your intentions were good, that's all that matters. I hope you have a great vacation, you deserve it! I'm so sorry this person is making your life so uncomfortable. That's just plain wrong. Consider the source and be glad you are the wonderful person you are! Oh, the addition of spicy sausage must make these cabbage rolls extra fabulous. I admire how you are taking the high road with this nut case...I know it's never easy. Have an incredible trip...can't wait to hear about your adventures upon your return!!! Oh my gosh, how awful to yell at someone at a wedding! Sounds just awful! Hope things get better soon! This stuffed cabbage looks delicious! Really flavorful! Cucina, these cabbage rolls look totally mouthwatering! Meatballs would be just as great for my husband. How upsetting for you. It's bad enough to be dealing with an issue like that at all, but to have it spill over into a public location is just terrible. I'm sorry to hear about it. Sounds like you have a very well-earned vacation coming up. Enjoy! Cucina49, I loved this! 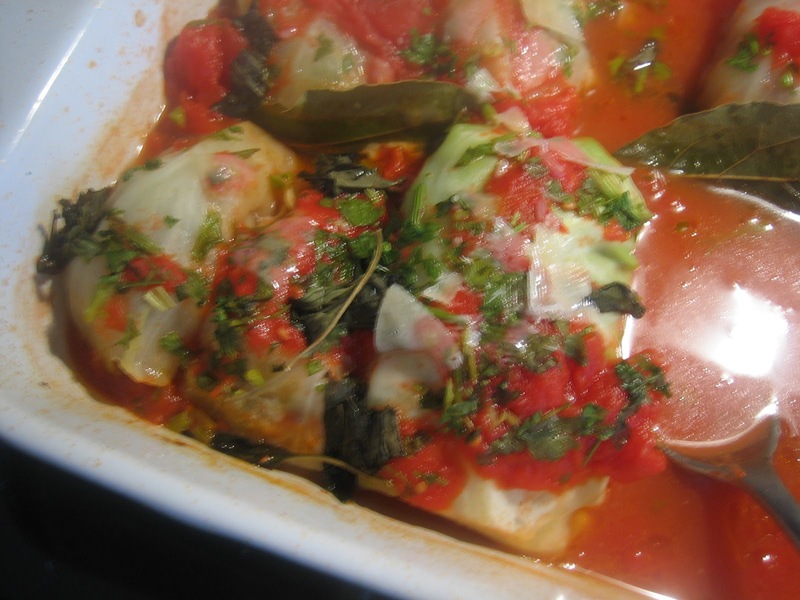 These cabbage rolls are similar to "dolmas" we make in India. Wonderful recipe! I'm so sorry that you had a painful emotional experience with your friend at the wedding. I hope he gets better soon and that you're able to rekindle your friendship eventually, if you choose. In the meantime, it seems like this wonderful Italian dish was just the comfort food you needed. Big hugs. So sorry to hear about your experience! That's terrible. Buuut these cabbage rolls look incredible. Oh no... so sorry to hear about the wedding incident. Hope you are feeling better by now. We cook similar stuffed cabbage rolls in Japan too, but probably Western influence. This looks healthy and delicious comfort food! Your vacation is almost here! I'm excited for you! I love stuffed cabbage, it always reminds me of my grandmom! Sorry "friend" was so unkind to you, and at a wedding, that is HORRIBLE. I hope you can put it all behind you and enjoy your vacation! It's been years since I have cabbage rolls! You've reminded me of how much I love them! These look wonderful! DISLIKE! Okay, that guy is a total douche. Time to write him off. Don't let him vex you, he ain't worth it. Yikes, sounds like you need that holiday just to get away from it all. What an appropriate recipe to leave us drooling over. Have a wonderful time! These look so good, you deserve your break!